I’m still working on questventure. It is more work than I had originally thought it would be. It occurs to me that miscellaneous comics is better than no comics. No, really, by “working on it” I mean I literally have the file for page 2 open and half-finished right now and did this comic because I realised that otherwise I wouldn’t be able to post anything today. I… now fully understand why full page comics usually update once a week. 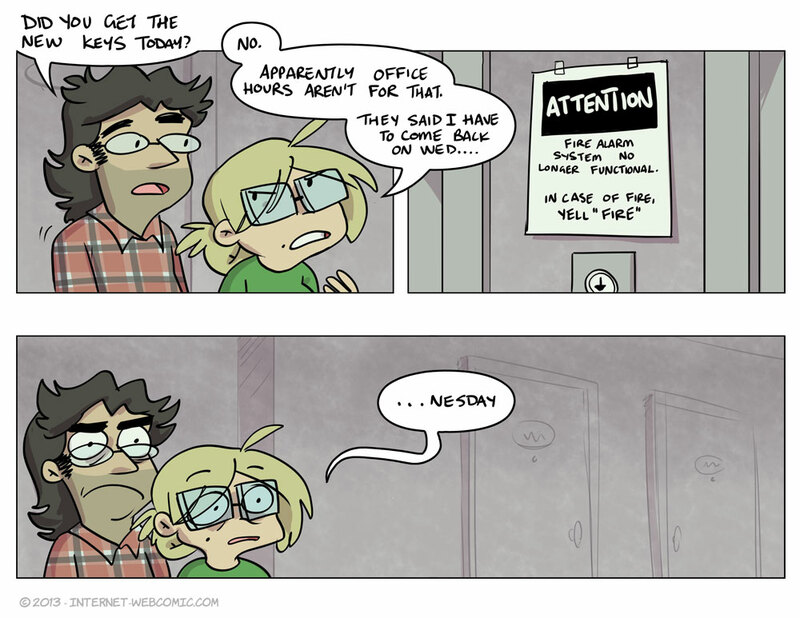 Here is a comic about a thing that is actually happening in my building right now with no hyperbole at all. My not dying in a fire relies on my hearing someone yelling through my thick front door. Man this is so absurdly illegal. See? your just started to stop smoking. Aww, I’m sure they’ll fix it some day. They’re supposedly fixing it today!